Tim Sullivan is a carpenter by trade, and his company, Warrior installations group takes on jobs of all types. Last winter, the company landed its biggest project ever, it was hired to install millwork at the new Hartford baseball stadium. On site, Sullivan said the work came fast and furious. As his crew finished one task, the general contractor, Centerplan Construction asked them to do another, including the gray Hardie Plank that defines the stadium's exterior. "We were here for just over 3 months. At the high point, I had just over 20 carpenters here every day, myself included," said Sullivan. Sullivan said he trusted that as the scope of work expanded, he would continue to get paid. But when the City of Hartford threw Centerplan off the job in early June for missing a May 17 deadline, the work stopped and so did the flow of money to the subs. He said he's owed close to 400 thousand dollars is still owed. Sources tell the Troubleshooters more than a dozen subcontractors have submitted six-figure invoices that have not been paid. The roofing contractor at the stadium, recently filed a lawsuit against Centerplan and Arch Insurance, the surety guaranteeing completion of the project. The suit claims the company is owned nearly 700 thousand dollars for work performed and invoiced at Dunkin Donuts Park. 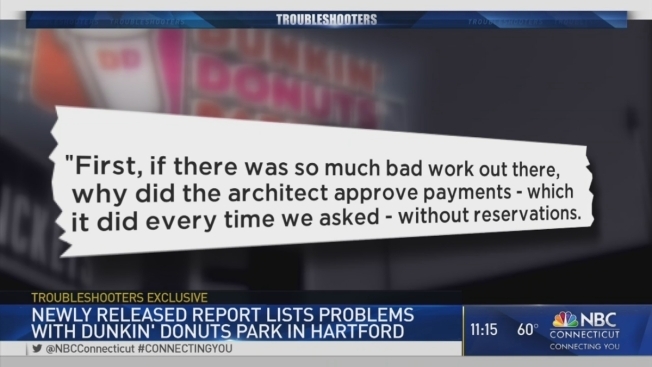 "First, if there was so much bad work out there, why did the architect approve payments - which it did every time we asked - without reservations. The architect certified construction was complete in an acceptable manner as late as May 30, 2016. Second, if there is that much poor work out there as they allege, then Centerplan cannot pay subcontractors. The city cannot complain subcontractors are not paid and also contend so much work is defective." Tim Sullivan said no one ever brought up any issues with the quality of the work his company did at the stadium. For a small business owner, waiting for three months for hundreds of thousands in payment is no easy task. Sullivan said last month he met face to face with a representative from Arch Insurance and said they approved his invoices. "Politics aside, whatever it is: we were hired to do a job, we do the job and we expect to get paid." The Troubleshooters reached out to Arch several times by phone and e-mail, but the company did not respond. "What it going to do to the business? Is it going to put it out? I seriously considered folding the business, but I just can't quit," he said. Even so, when work resumes at Dunkin Donuts Park, Sullivan is hoping that Warrior Installations Group will be brought back to see the job through to the end. "Military mindset, mission has to be accomplished. That's why we want to get back here. I want to finish the job, sense of pride. When I bring my kids to a Yard Goats game and said 'we built that!" It's been 10 days since Hartford city leaders announced that Arch Insurance has agreed to take over the project, but there is still no signed agreement. Sullivan believes the ball park would have been done in 30 days if they'd kept working at the same pace. Now, with time needed to restart the job and the lack of urgency, he thinks there's about two months of work to complete to get Dunkin Donuts park ready for baseball. The City of Hartford did not respond to our requests for comment on any money that’s still owed subcontractors.